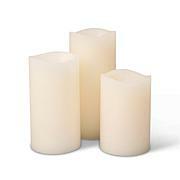 Bring the soft flicker of candlelight anywhere to any room in your home. 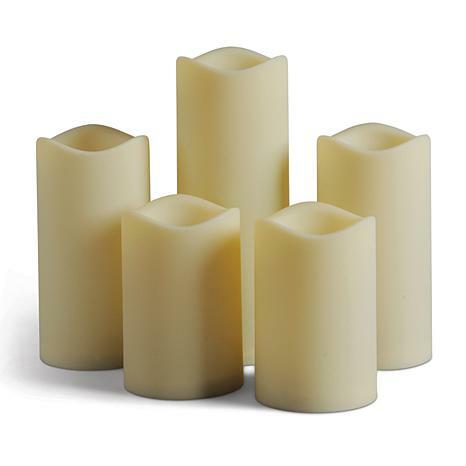 This 5-piece resin candle set can be used indoors or outdoors and features a soft touch finish in bisque for a realistic wax-like appearance. The soft glow flicker mimics a true candle, and it also includes a timer function that stays on for 5 hours and turns off for 19. 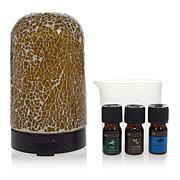 Flame free, smoke free and worry free. Just the way you like it. Entire candle is fully lit from top to bottom. Not just a little light source in one tiny area of the candle.Lightweight too. Like the convenience of a bundle, cheaper than buying individually.